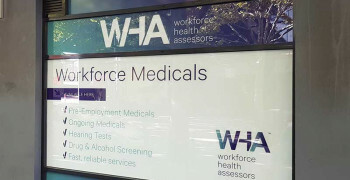 Here at Workforce Health Assessors (WHA), we’re passionate about growing our network, as well as increasing our reach and capabilities as national health assessment and workforce medical experts. With clients at the forefront of our business, we believe opening more face-to-face centres around the country is key to meeting our clients’ needs. We believe that providing personal, professional and efficient services is paramount when it comes to the delivery of good service. It’s part of the reason we’re so excited to be expanding our network each and every month. Established in Australia in 2004, WHA is the fastest growing and number one specialist pre-employment medical provider. Our highly skilled team offer comprehensive and detailed pre-employment medical assessments that can be tailored to suit a business’s specific needs. 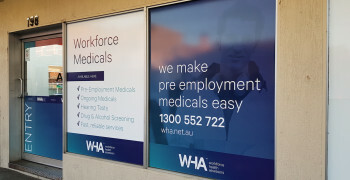 With more than 40 sites spanning Australia and New Zealand; WHA has developed a solid reputation built on quality client and candidate experience. Our own innovative software enables us to conduct tailored pre-employment medical assessments to Australian state or territory and NZ requirements; ultimately offering faster results and assessment reports via an easy-to-use platform. Pre-employment medical assessments help to contribute to a safer working environment, reduce workplace injuries, downtime and insurance overheads, and assist businesses to match the capacity of the employee with the job role. Workplace risk is significantly reduced with the knowledge a potential candidate is fit for work. In late 2018, we were proud to announce the opening of our Geelong facility, marking another Victorian dot on the WHA map. With the region buzzing with a range of industries where workplace health and safety is of vital concern, we’re so pleased to be offering an effective yet simple solution for a variety of businesses, from transport, building and construction, local and state government, to aged care, child care and even health care. 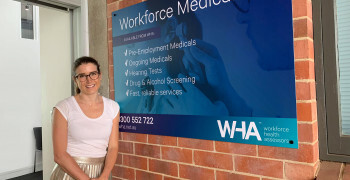 WHA Geelong offers our full range of services, including pre-employment and ongoing medicals, drug and alcohol screening, hearing assessments and vaccinations. Our Geelong team includes a range of qualified health-care professionals including Doctors, Nurses and Exercise Physiologists. 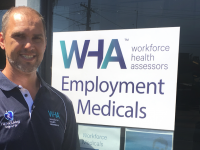 Visit Tim and the rest of the WHA Geelong team on 37 Mercer Street, Geelong for your next health assessment. Contact WHA on email or phone 1300 552 722 to book now. How long have you lived in Geelong? Since I was 12 (26 years ago). If you had a guest visit Geelong, where would you take them? I’d take them down the Great Ocean Road, and to my favourite restaurant in Geelong – Tulip. What do you like doing in your spare time? I love working out, hanging out with family and friends, and working on self-development.